Looking for the Tiny Seamstress giveaway? Click here or scroll down. Closes tonight. Looking for the Workbox giveaway? Scroll down or click here. Do you need another autumn decoration idea? One that uses some things on hand? How about using that old lamp shade that you’re tired of looking at? Or how about you go and find an interesting one at the thrift store. There’s probably a huge variety there. And I have to share with you a really great product that I was introduced to. Emily, from Simply Spray found here, contacted me about their great product. They produce a great spray paint for fabrics and upholsteries. Do you know what this means for all of us crafters? We can just spray over an ugly couch fabric or spray some old dingy curtains to match our new decor. Wow. A true time saver. And I am not being paid for this at all. I was just sent some samples to use and ended up loving them. Mostly because first of all, there was no smelly spray paint odor and secondly, whatever fabric you spray retains its soft touch. It doesn’t leave a crust of paint on the surface of things. It actually soaks in and changes the original color while keeping the soft feel of your fabrics. Strange how that works……but fantastic. Anyway, I started with this brown paint……..
……..and applied it to this lamp shade, that had a fabric texture to it. I let it dry completely and then hot glued some fall leaves leftover from this project. I won’t keep this shade on year round……..just for the fall. But it turned out kind of fun to have a different shade for the season, in a nice and rich brown color. Thanks again Emily and Simply Spray. Simply Spray products are available in some stores (check their website) or online here. **There will be more projects using this paint over the next few months. I loved it that much. « Another SPONSOR and GIVEAWAY….feeling lucky?? where do you find the fabric paint? Oh WOW!! I didn't know they made anything LIKE this!! That's amazing… where do they come up with this stuff?? I am ready to change my couch, but wasn't sure about a shifting slipcover. I actually thought, I wonder if I can paint it. Well…now I know I can! I'm not sure about doing a whole couch, but it would be worth trying on the throw pillows to the couch! ok LOVE the lamp shade! I have a key question though – do you think you would love that fabric spray enough to put it on a piece of furniture? I have a hand-me-down piece of furniture that is WHITE. White + 1-year-old = no longer white. What do you think? I have a couch that could use some freshening. I would love to hear if anyone has done a whole couch. What an interesting product, I'm glad to know something like this exists. Thanks for sharing! UM AWESOME! I'm heading out to Michaels to pick some up tomorrow. Actually, the couch is what is shown on the front of the spray paint can…..and they have a whole FAQ section on their site answering these sort of questions. The paint keeps the fabric so soft, so I would really paint one. My couch doesn't need painting but if it did…..this would be an excellent choice before deciding to buy a new couch. So cool, huh? That is sooo cool. Love it. 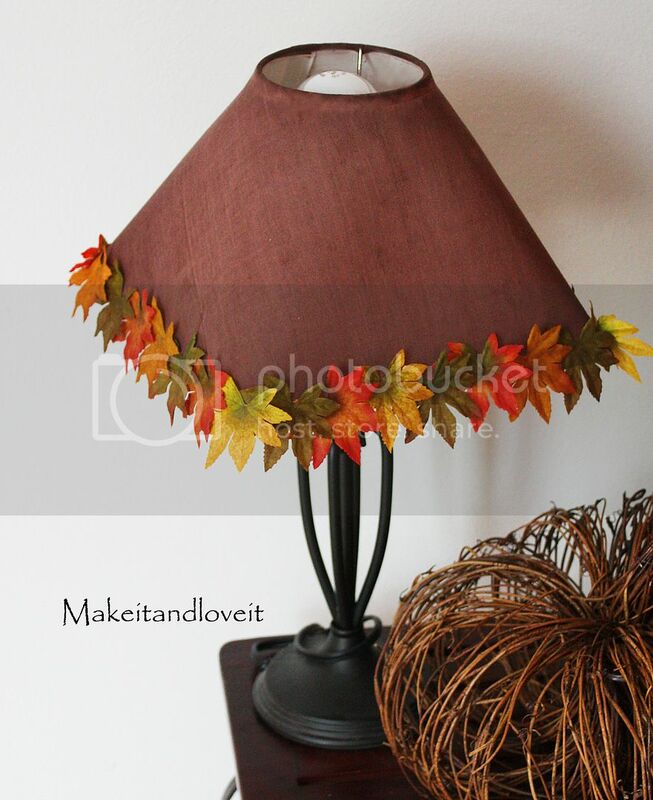 Your fall lamp is gorgeous! You're quite the creative one!!!! Love your blog! Will keep checking on your creativity! I love this one too! Makes me want to visit the thrift store and look for lamps, lol. Very unique. I really really like this !